This is not referring to the ITV series, which has just returned for another series at the Solana Hotel. 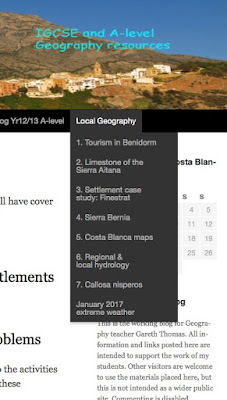 It's the resort and area of Spain, which is featured as part of the resources on this COSTA BLANCA blog. There are some very useful resources, which are the work of teacher Gareth Thomas. There are iGCSE and 'A' level resources amongst them, but one of the most useful sections is under the tab 'Local Geography'. These provide a very useful case study of local geographical landscapes within the region. Browse through for other useful resources and lesson ideas.